Soai Rap river channel currently has quite shallow places. Therefore, Long An province proposed the Ministry of Transport to soon organize dredging in order to facilitate the large vessels. Long An international port is a part of port group 5, which plays an important role for the purpose of strengthening the connectivity of import and export trade of provinces in the Mekong River Delta, Ho Chi Minh City and the world; it contributes to solving the situation of cargo congestion at the river port in the region. Thereby, transportation costs for manufacturing and import-export enterprises are reduced, the competitiveness for goods products is increased on the international market. Currently, the wharf No. 1 with a length of 21meters is capable of receiving 3,000-ton full-load vessels. In 2017, Long An International Port received nearly 100 domestic and foreign vessels with a variety of goods. Currently, the wharf No. 2 with a length of 210 meters is under construction, expected to be completed in 2019, capable of receiving vessels of up to 50,000 tons; Simultaneously, it will deploy the construction of wharf No. 3 in the future. However, the current difficulty is that there are some shallow ranges with depth of -7.1meters and -7.3meters in the middle of Soai Rap river. This makes difficulties for Soai Rap river ports to receive large vessels of 30,000 tons or more. For maritime safety reasons, Long An Port has to regularly refuse to receive large vessels. Facing this fact, Long An province has continued to propose the Ministry of Transport to organize dredging of Soai Rap river to reach a minimum flow of -12.6 meters recently. 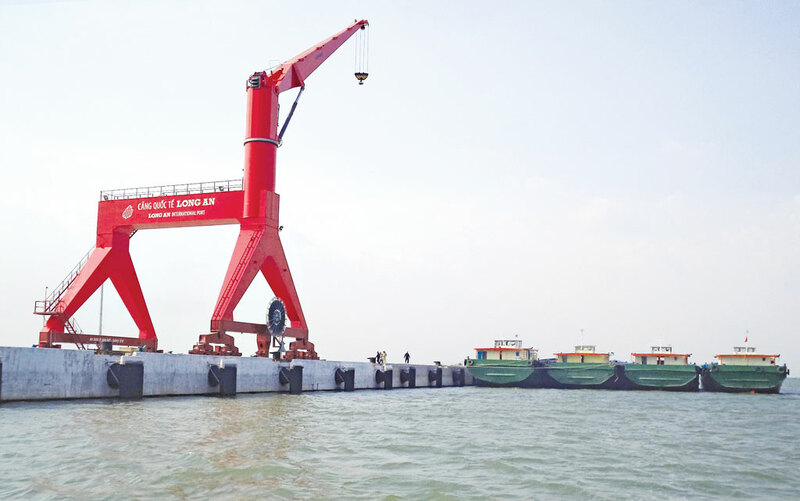 This will meet the operational requirements of Long An International Port and serve the development needs of Hiep Phuoc Port - Ho Chi Minh City, it contributes to promoting the transportation of goods by waterway, reduces road congestion and pushes up socio-economic development in Long An, Ho Chi Minh City and Mekong Delta provinces. Previously, Long An Province issued a written request to the Ministry of Transport to deploy dredging Soai Rap river on July 6, 2018./.